Dallas, TX | Intermodal Bridge Transport Inc. Opened in 2005, IBT is located within 20 minutes of both the Union Pacific and BNSF rail ramps. The facility serves as the Gulf hub to service Dallas/Ft Worth Metroplex area, Texas, Oklahoma, Louisiana and Arkansas. We offer storage at our 10 acre facility which is operated 24/7 and full secured. Our staff is available during extended hours and is always on call 24/7. Our equipment fleet consists of tri-axle chassis and standard chassis contracted through our chassis pool providers. Garland has been in the trucking industry for the past 12 years. 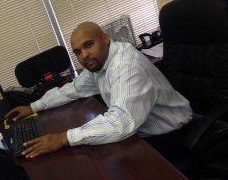 He joined IBT in 2008 and has worked his way up through the ranks and now heads the office as Terminal Manager. Garland has excelled in operations and sales, making our Dallas location one of the most successful ventures today. He served in the United States Air Force, where his training has attributed to his ability to work efficiently and run a lean and mean operation. On his off time he enjoys playing football and basketball and is the founder and President of a youth football league.